This week more than 600 Bearkats who are soon to graduate received their class rings. 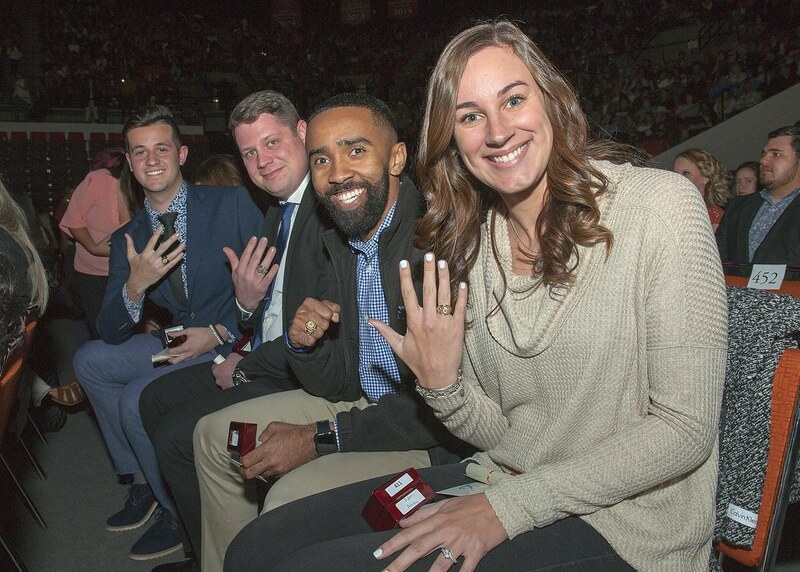 In order to be eligible for a ring, students must have completed a minimum of 75 undergraduate credit hours. SHSU introduced class rings in 2004 and shortly after a special tradition arose. “We started a tradition where we take the rings and house them in the Woodlands home on the museum grounds in Sam Houston’s bedroom. His spirit watches over them, as we like to say, the night before the ceremony,” Brandon Cooper, director of Student Activities said. This tradition is now mandatory for all rings, so each one that is handed out now spends the night in Sam Houston’s home. Below is a collection of photos by Brian Blalock from this semester’s ceremony posted to the SHSU Alumni Relations Flickr. Students wanting to purchase the individual photos taken by Action photo may go to actionphotosonline.com or call 830.625.4010.